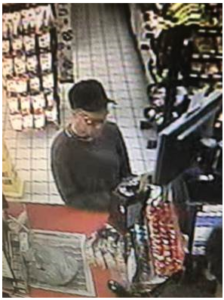 The Palm Beach County Sheriff’s Office is seeking the public’s assistance identifying a suspect WANTED for fraudulently using a stolen credit card at a Shell Gas station. An unknown male was captured on a business surveillance using a stolen credit card. The suspect is known to ride a light colored motorized scooter. This incident occurred on January 11, 2019. Shell Gas station is located in the 4000 block of Lake Worth Road, unincorporated Lake Worth.